The small island archipelago of Koh Phi Phi is part of the Kingdom of Thailand, surrounded by the Andaman Sea and just over 45 km from the southern Thai main tourist destinations Krabi and Phuket. Even before my trip in December and January, I knew that the area has a reputation as a great dive site. However, I did not expect that I would actually do it myself: diving in the open seas. 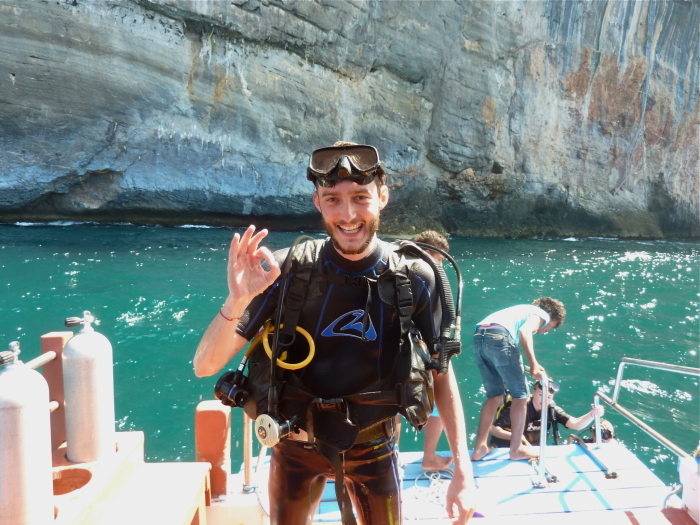 But yes, I’ve actually done it, I went diving! Even more than 13 meters deep! With blue spotted rays, filefish, harlequin sweetlips and Nemo. With riffs that deep down into a mysterious dark and with a rich and breathtaking underwater world in which I was allowed to be a guest. Well, I’ve noticed that diving is really not that hard to learn. Because on your first dive, your instructor will do the whole job. At a discover scuba diving course you really need nothing else to do than to listen well, have your wits about one, follow the instructions and let yourself fall into the blue depths of the ocean.